“Can’t feel what I need too.” she would say. 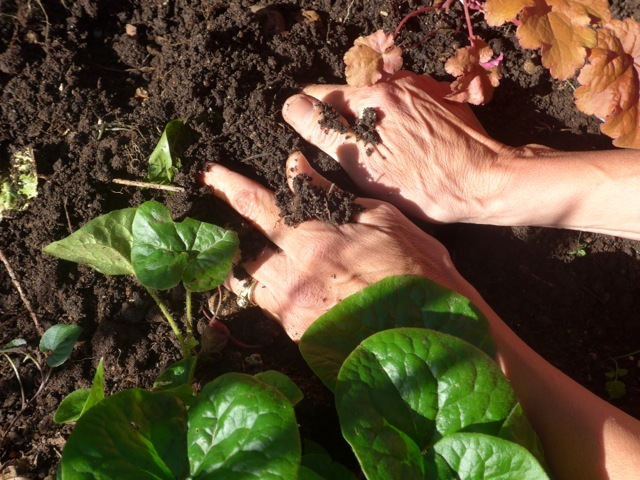 I remember in the last decade of her life, when aging joints and declining health kept her from her beloved garden, the skin on those hands grew translucent, revealing the network of veins that had fed those working hands. Confined to a wheelchair, she would sit before her picture window and watch over her garden. Always calling my attention to notice the new subtle changes of the day. She would watch me pick a bouquet from her yard and when she put her nose to the fragrance, I saw her swept away into the world of her heart, the natural world. I see in my own hands now, the sun browned skin and callouses of the gardener and I think of her ~ my mother. My skin shows wrinkles and the leathery toughness of outdoor life. My fingers are long and slender and my veins generous, healthy. Hands. That with which we grasp at physical life. That with which we hold on, reach out for, clasp around, grip with welcome, wash too much. Those hands given to us by God. He carefully fashioned them, giving us tools ~ good sturdy tools. Hands. I think about the work of my own hands, to rub backs, roll out piecrust, fold laundry and so much more. They allow me to write, to translate the intangible into tangible. God uses our hands to write his stories. My hands. Your hands. Gods tools. Vehicles of expression. They convey feelings: thumbs up, thumbs down. They give direction: a beckon, a warning. Imagine the great hands of God, fashioning a woman from a man, weaving together sunsets, building mountains. The very great hands of God. A sweep of one could change the face of the earth, yet He holds back. He waits. He holds open ~ his hands. So wonderful! My lovely sister. Our Mom was special, so beautifully captured here. Our hands will continue to work the soil. Write on! Nile Clarke, older brother. Wow!!! You touched my heart today. Thank you. My mom has severe Rheumatoid arthritis, and it has destroyed her beautiful hands. Although she is a real go getter, she can no longer work in the garden she loves; she can barely play the piano, her love. While it is so hard to see, you made me realize the beauty of the life we live- the life we share. Thank you. Dear Cindy, this was exquisite . My mother and grandmothers loved gardening and so I do too. The night before my mother died my brother took her to get perennials and she spent her last evening alive prepping the flower beds. We buried her the day before Mother’s Day and planted her flowers on Mother’s Day. You are a beautiful writer and photographer. I enjoyed spending time on your website this morning. Thank you for the glimpse into you amazing Northwest life! The joy of the earth is a grand gift and you offer it uniquely so. I love the image of hands…your moms, yours, mine and Gods. So much is held in hands…so much life given through hands. Thank you for engaging my heart as I remember the hands I’ve held. Those hands have brought encouragement, comfort, peace, safety and so much more. Blessings to you! I just read your post today and I am enjoying your words. One of the special ways my children enjoy my hands is that when we can not hug in the traditional way is that we give “Hand Hugs” often from the front seat of the car to the back or through a car window as the last goodbye. Thank you for reminding me of the great gift of our hands and the many ways we use to BLESS others.